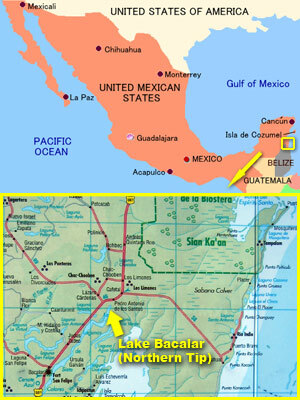 Lake Bacalar is in the Mexican state of Quintana Roo, adjacent to the (states of) Yucatán and Campeche. The lake itself is 50 kilometers long (north to south), but at most just 1 Km wide. 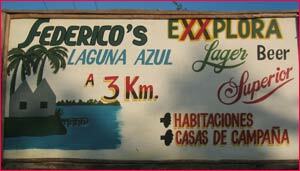 Its southernmost point is just north of the Belize border and Chetumal. Click here for an even larger map. Step 1. Fly to Cancun. Search around for good rates. It's a major tourist destination, so with some research and some flexibility in your dates, it should be fairly easy to find a round trip from the USA for less than $500. If your plane arrives late and you plan on taking a bus to Lake Bacalar, you might want to book a hotel room and leave in the morning as you've got at least five hours of travelling left ahead of you. Step 2 option A. (Expensive.) Rent a car and drive it south to Pedro Antonio de los Santos. From the map, it looks like it's about 321 KM (200 miles). It's a fast, newly paved, totally flat and mostly straight highway so you can expect to make good time, say four hours. That said, when going through villages watch out for topes – the home-made speed bumps that will send your teeth flying out the top of your skull if hit them going fast. As you pass through the south end of Pedro A. Santos, just after the very last speedbump, there's a small billboard and turnoff on the left (heading east) at KM 59 for Federico's Laguna Azul. It's a 3 Km mostly dirt road. See the map to the left for more detail. Step 2 option B. (Cheap.) From the Cancun airport, take a taxi to the Cancun bus depot. This is north of the Airport in downtown Cancun, which is a 20 minute ($20 US) taxi ride. Take a Second Class MAYAB bus that's southbound for Chetumal. (Second class because the first-class bus doesn't stop in Pedro Santos.) Schedules can change, but the last time I looked it seems like MAYAB buses leave for Chetumal every hour or two. At any rate, once you're on the bus, ask the driver to let you off at Pedro Antonio de los Santos. (About five hours, and $20 US.) Pay attention when you pass through Limones, since Pedro A. Santos is just 10 minutes farther. If you have arranged for me to pick you up, I will be there waiting for you. If not, sometimes there's a TAXI waiting nearby the bus stop that will take you to Federico's Laguna Azul (3 Km) for about 50 Pesos. If the Taxi is not around, ask any nearby shop to find out who might be available to give you a ride to "Federico's Laguna Azul." English is by and large not spoken here so come prepared with your phrases en español. Anyhow, there are at least two other guys in town who drive people to Frederico's place from time to time. Be sure to agree on a price first. (Should be about 50 Pesos.) If you're feeling strong and don't have a lot of gear, it's even possible to walk from the highway to Federico's place or mine – maybe 30 or 45 minutes. Step 3. Where do you want to go? The closest and easiest destination is Federico's resort. He runs a little restaurant, two fully enclosed cabanas, and camping facilities. It's a great place to swim, hang your hammock, and meet a pretty unusual cast of characters. Fritz's place also features hot showers and clean toliets, which is sort of a luxury in these parts. A three minute walk south takes you from Fritz's place to mine, which, depending on when you are reading this, is either a plot of jungle like any other, or a nicely developed camping area. Note: Federico has also written a guide on "how to get there" which is here.